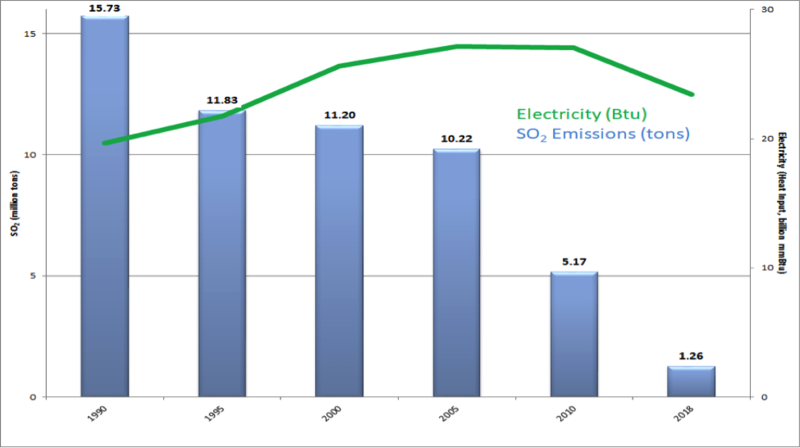 Due to policies and economic technology, emissions from electric utilities continue to decline. According to an EPA report, sulfur dioxide emissions declined by 92 percent between 1990 and 2018, nitrogen oxides emissions declined by 84 percent between those years, ozone season nitrogen oxides declined 83 percent between 1997 and 2018, and carbon dioxide emissions declined by 24 percent between 2005 and 2018. The large reductions in emissions occurred despite increasing output from U.S. electric generators. Electric output increased by 19 percent between 1990 and 2018. The Clean Air Act Amendments of 1990 established the Acid Rain Program and required reductions of sulfur dioxide and nitrogen oxides from the electric generating sector. These pollutants are the primary precursors of acid rain. The sulfur dioxide program sets a permanent cap on the total amount of sulfur dioxide that may be emitted by electric generating units in the contiguous United States. The program set a cap on sulfur dioxide at 8.95 million tons in 2010, a level of about one-half of the emissions from the power sector in 1980. 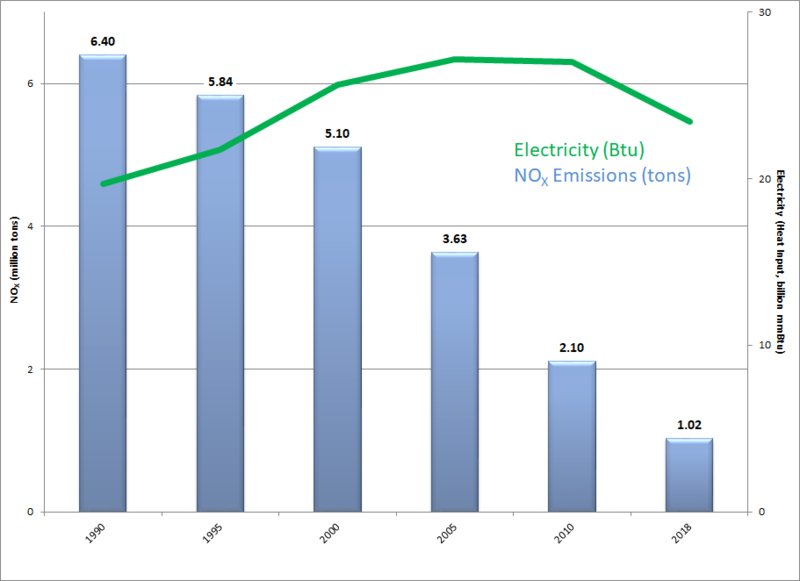 U.S. electric utilities surpassed that reduction in 2010 and sulfur dioxide emissions in 2018 were a mere 1.26 million tons, down from 17.3 million tons in 1980. Sulfur dioxide emissions are now about one-fourteenth of what they were in 1980. Nitrogen oxides reductions are obtained from a subset of coal-fired electric generating units and follow a more regulatory approach to achieve reductions. Nitrogen oxides emissions decreased from 6.40 million tons in 1990 to 1.02 million tons in 2018, meaning today’s emissions are less than one-sixth of what they were in 1990. The Acid Rain Program was the first national cap and trade program in the United States, which provided a system of allowance trading that uses market-based incentives to reduce pollution. Reducing emissions in this manner provides regulated sources with the flexibility to select the most cost-effective approach to reduce emissions, whether it is through the addition of scrubbing technology or through switching to lower sulfur coal. Much coal production was shifted from higher sulfur eastern coal to western coal, primarily from Wyoming, where sulfur levels of coal are much lower. Also affecting these emissions is the Cross-State Air Pollution Rule that requires member states to reduce power plant emissions that contribute to ozone and/or fine particle pollution in other states. On September 7, 2016, EPA finalized an update to the Cross-State Air Pollution Rule. Starting in May 2017, the rule reduces summertime (May – September) nitrogen oxides emissions from power plants in 22 eastern U.S. states, reducing ground-level ozone. 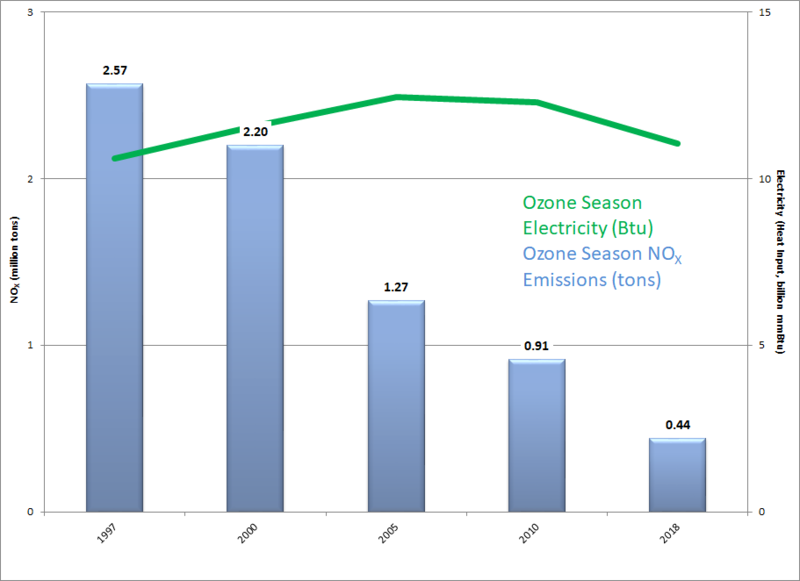 Ozone season nitrogen oxides emissions decreased from 2.57 million tons in 1997 to 0.44 million tons in 2018. Carbon dioxide emissions are declining in the power sector due to lower coal-fired generation and increasing generation from natural gas, which emits less carbon dioxide than coal-fired generation, and increasing renewable generation, driven by renewable energy mandates and direct subsidies of billions of dollars per year. Carbon dioxide emissions from the U.S. generating sector declined from 2.16 million tons in 1995 to 1.93 million tons in 2018. Unlike sulfur dioxide and nitrogen oxides, there is no inexpensive way to remove carbon dioxide emissions during the combustion of fossil fuels to generate electricity. Current carbon scrubber technology is expensive and not proven on a commercial scale. The United States has made substantial in-roads in reducing acid rain and achieving major emissions reductions from the U.S. generating sector. Reductions in sulfur dioxide and nitrogen oxides were initially due to legislation and regulation stemming from the Clean Air Act and the Cross State Air Pollution Rule. Electric utility carbon dioxide emissions have been declining due mainly to market dynamics stemming from lower natural gas prices due to hydraulic fracturing and horizontal drilling technology to obtain natural gas from shale formations. 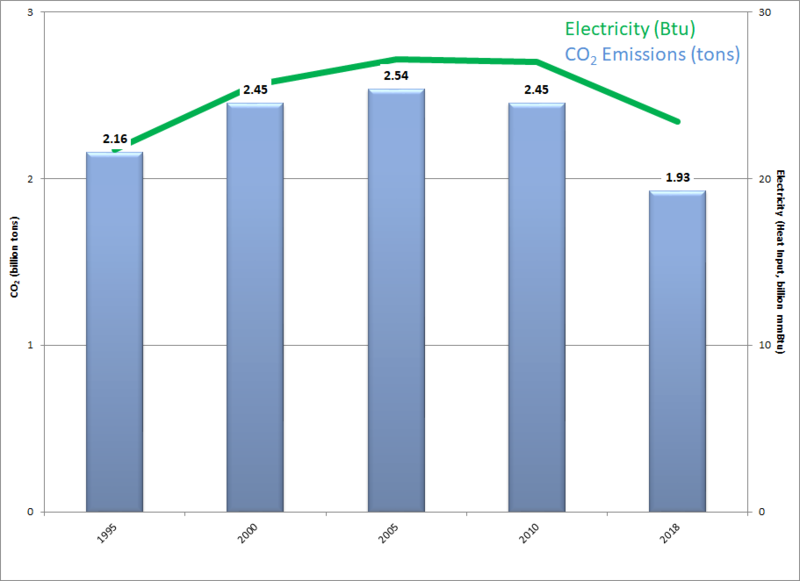 Renewable mandates and subsidies also helped to reduce carbon dioxide emissions. Americans now enjoy the cleanest air many of them have ever experienced, and all signs point to increasingly healthy air, even as the United States has become the largest oil and gas producer in the world. The future of energy in America is bright; our air is clean and getting cleaner every day.